Building a custom kitchen allows you to design cabinets to fit your home and lifestyle. Working with Custom Wood Products' experienced designers and builders, high quality construction is tailored to meet your needs. Custom Wood Products is committed to working with you to create specialty designs that meet your style and taste. We also offer custom design for our commercial customers. Custom order cabinets are a predesigned line of cabinets that allow for the customization of door, wood and stain options. 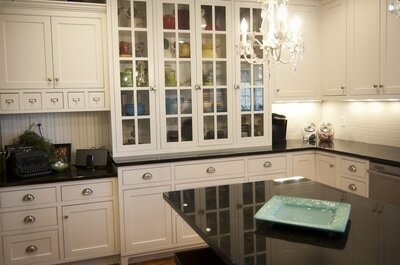 Custom Wood Products is an authorized dealer of Bridgewood Custom Cabinetry. Through Bridgewood, we offer two competitive cost-effective cabinetry lines plus our quality guarantee and professional, personalized installation. Bridgewood also offers a commercial custom order line. Custom Wood Products offers custom furniture design to meet your creative and functional needs. We also specialize in custom signage design. Our new technology allows us to take any computer file and create professional, all-weather signage. We can also provide a new laminate overlay and hardware to help rejuvenate your existing kitchen or bathroom. We sell specialty hardware in addition to hardwood and sheet goods.